Thank you to Jenny a lovely lady who put together some of my Kelpies on her beautiful mugs, bags, t-shirts. This photo is taken from one of the mugs that Jenny made for us. 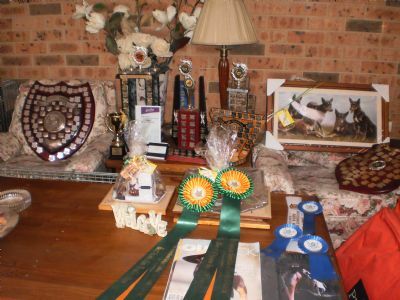 This page is to display the trophies and ribbons that the dogs have won over the years. I have taken so many photographs but just stored them away on file. Decided that it would be nice to see once again the trophies from years past and present. This page will take a little while to put together as I have to go back and find the older photographers from way back in my files. The dates on some of the photographs is also wrong. At the time my camera was not working properly and I could not change the dates on the photographs. Aust. Kelpie Club of NSW Speciality Show BIS Shield (on left) won by our "Becky"
Sydney Royal 2014 Best Breeder In Show trophies, medal for Best of Breed, medal for "excellence"
won the award in 2009 and 2014.
then went on to win Best Breeders Team In Show. 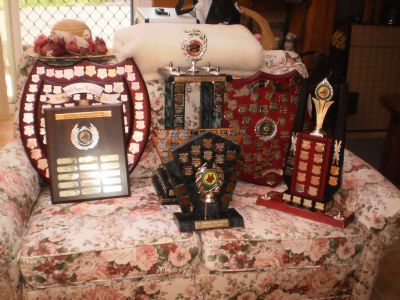 Trophies won by the dogs for these awards. 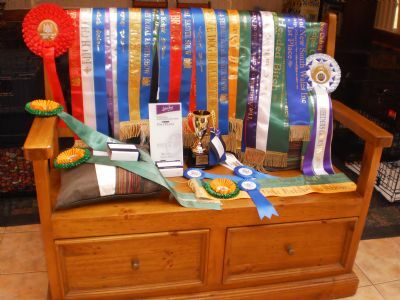 also gained her Grand Champion Title the same day. 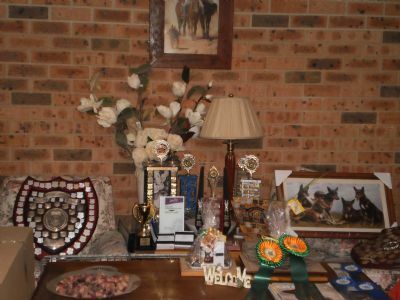 Glass trophies are for "Chelsea" and "Bundy"
for Winner of Winners at the Working Dog Club Point Scores. Grand Ch. Title trophy for our "Chaos". Glass wine decanters also won by "Chaos" for Best Exhibit in Group wins. Best of Breed Melbourne Royal statue won by "Chaos" and the goblets were won years ago by "Uluru"
for Intermediate In Show at the Working Dog Club Show. in the background was from Dortmund in Germany won by a dog that I have exported to Holland. Melbourne Royal Top Eight In Working Dog Group - Chaos. 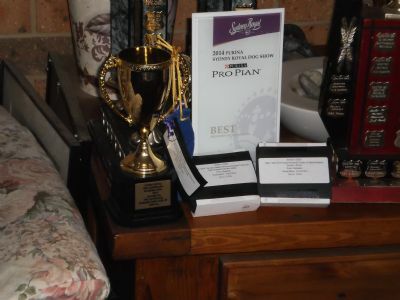 Silver tray won by our "Possum"
for Best Exhibit In Show at the Australian Kelpie Club Speciality Show.